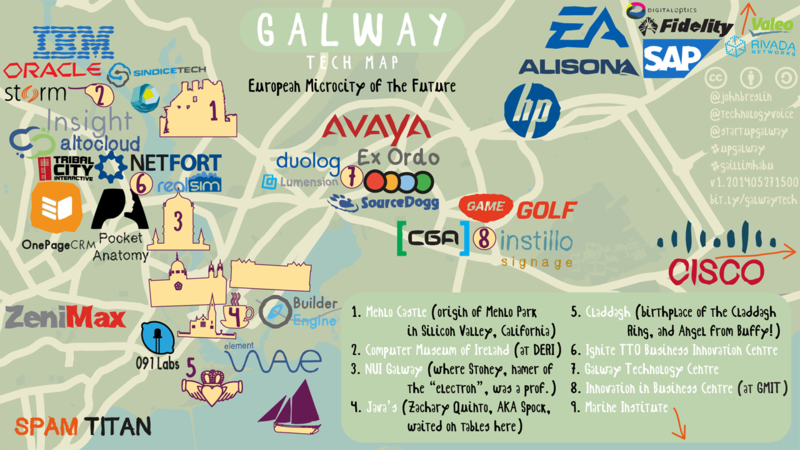 Galway Tech Map. Click here for a larger 1280×720 version. Background is from OpenStreetMap and some logos are from Wikipedia. Barry O’Sullivan, CEO of Altocloud and investor on RTÉ’s Dragon’s Den, remarked to me recently that if Dublin is becoming the new Silicon Valley of Ireland and Europe, then Galway is our San Francisco. At Technology Voice, we’ve long held the opinion that Galway is a mini San Francisco, and recently the Financial Times’ FDi Magazine ranked Galway as the top microcity for investment in Europe. Galway is becoming a global tech hub with a focus around the ICT (software/hardware/Internet) and biotech segments. Tech startups like OnePageCRM, Ex Ordo, Element Wave, Duolog, Netfort, BuilderEngine, Pocket Anatomy (winner of The Next Web top startup award), Altocloud, SpamTitan, RealSim, Tribal City Interactive and Alison.com are in close proximity to larger companies like DigitalOptics Corporation, Cisco, HP, Avaya, SAP, IBM and EA.